Having Celiac Disease, it’s extremely important to follow a gluten-free diet. My hardest adaption to this was finding sweets that I actually liked. I have a huge sweet tooth, so it was cupcakes and cookies for me almost every weekend. Since being diagnosed, I like to make my desserts at home on occasion now. It has taken me a while to find brands that actually taste good, but with some searching and trial and error, I have found some favorites. 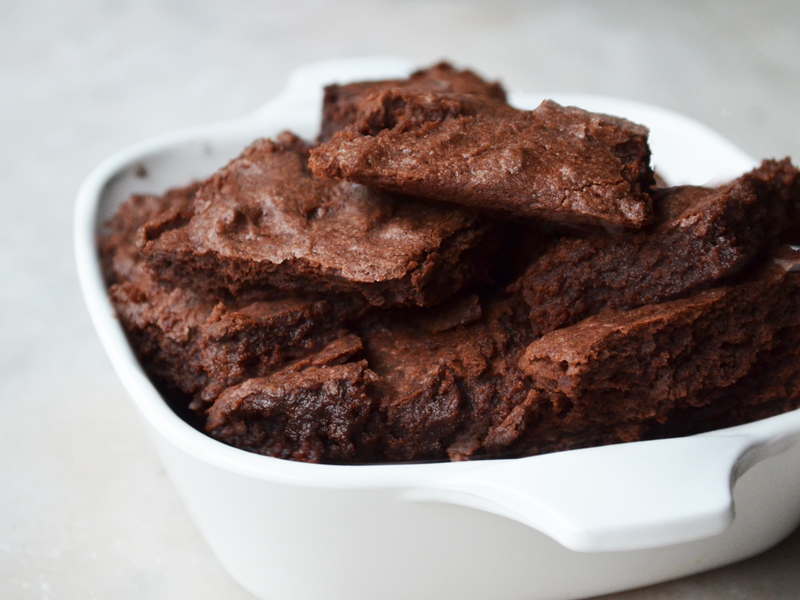 Brownies are probably every girls weakness and it’s so important to find a mix that will give you the right consistency – a little hard around the edges but chewy and gooey on the inside. I discovered ginnybakes while roaming the isles of my local health food store and decided to give this brownie mix a try. ginnybakes is Organic, Gluten-Free, Kosher, Vegan, and Non-GMO. Their company offers already baked cookies, bars, crumbles, and mixes, which are great to whip up at home. 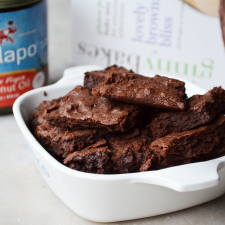 Along with this mix, I used coconut oil as a replacement for canola oil, which really brings out the chocolate flavor, along with helping keep the brownies super moist. I chose to just stick with the plain brownie mix for the first batch, but feel free to add in additional mix ins, such as nuts or white/dark chocolate chips – yum! Preheat oven to 350F and spray an 8×8 square pan with Kelapo Coconut Oil Cooking Spray. 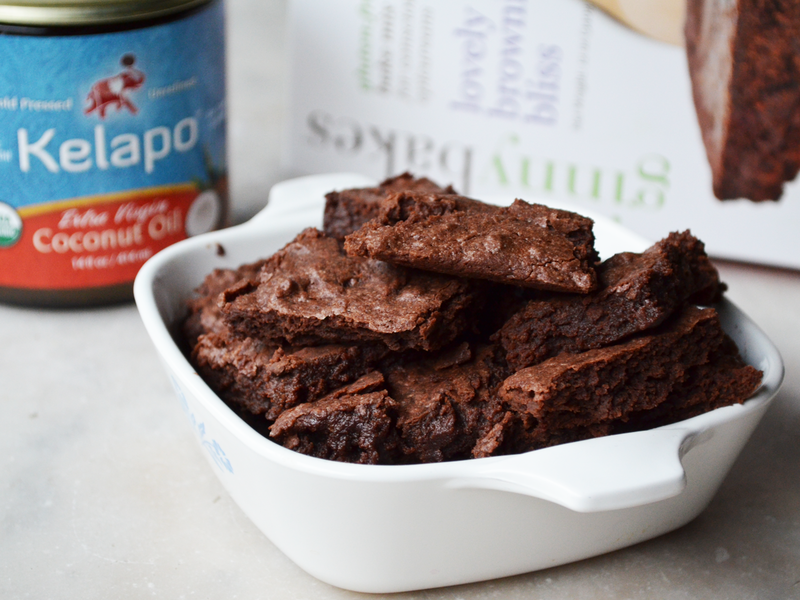 In a large mixing bowl, add the ginnybakes Brownie Mix and combine melted coconut oil, water, and egg. Mix all ingredients until thoroughly combined and pour into brownie pan. Bake for 18-20 minutes or until a toothpick comes out with just the right amount of crumbs. This will help keep the brownies even more moist. Remove from oven and keep on stove top for approximately 10-15 more minutes. During this process, the brownies will continue to cook. Once cooled, slice, remove and enjoy! 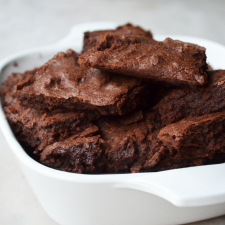 These brownies are so good by themselves, but better yet, I added a heaping scoop of vanilla frozen yogurt to them!